A Matter of Memories: Sunday Spur for Scrapbookers #4 - FONTS! FONTS! FONTS! Sunday Spur for Scrapbookers #4 - FONTS! FONTS! FONTS! 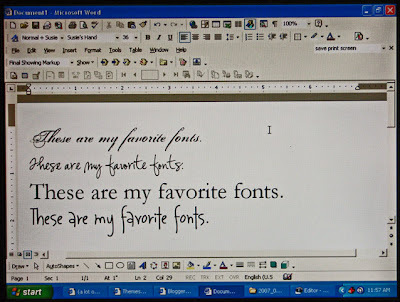 For many scrappers, computer fonts are an indispensable part of scrapping (except for those that are blessed with 'in vogue' handwriting, present company unfortunately NOT included). So, this weeks challenge is to share your top 4 favorite fonts right now and tell us why they top your list. I say 'right now' because I know preferences can change over time. I actually remember a time when Comic Sans was a favorite of mine...no more!! Then, share you favorite font site for finding new fonts. #1 - Porcelain - This is a great edgy font for titles (not very readable in small sizes). I think it goes great with some of the 'edgier' paper lines out there right now like Basic Grey and Fancy Pants. #2 - Susie's Hand - As I said earlier, I am not blessed with the best handwriting for scrapping, so I love fonts that 'look' handwritten. Here's a scripty one that I've been using a lot lately. #3 - Garamond - This is more of an old-fashioned type, but you always have to have one of those in your arsenal. #4 - Journaling Hand - Just as the title states...it's great for journaling. It's a great looking font with a handwritten print look. DaFont - No contest...they have frequent additions, 9 different searchable themes (including dingbat fonts) and a "Top 100" listing. The best part - everything in this site is FREE! !